Happy New Year to you all! 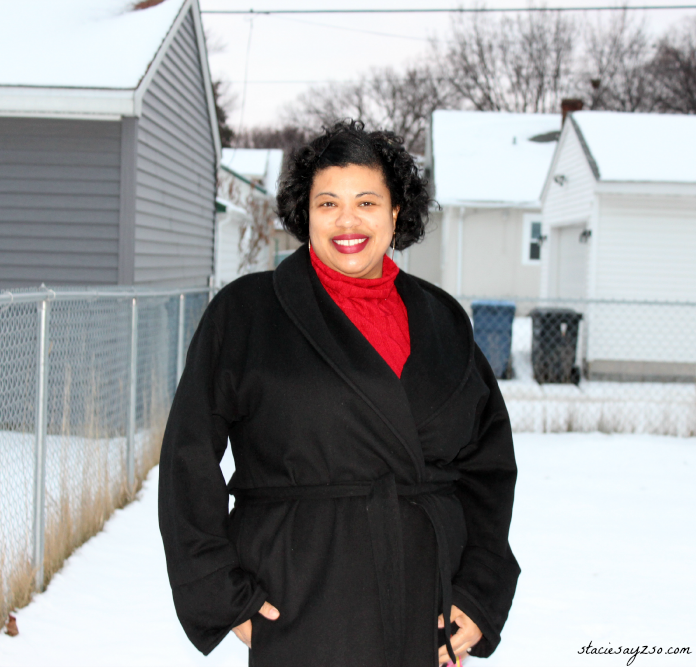 Today I'm sharing my wrap coat that I have had for years. When I heard that wrap coats were back in style, I was thrilled to pull it out the closet. 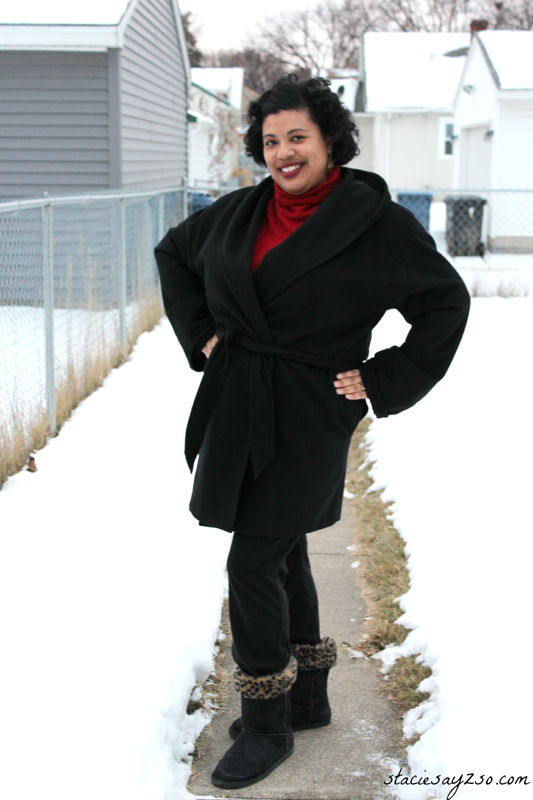 This coat came from New York & Company, one of my favorite stores. I paired it with a red turtle neck and black yoga pants, as well as comfy boots with cheetah print detail. Now, I will say this. This coat is more for your warmer Winter days. Today in the Midwest, it's -25 below windchill, so I dare not wear this coat. In fact, I'm not going outside at ALL! 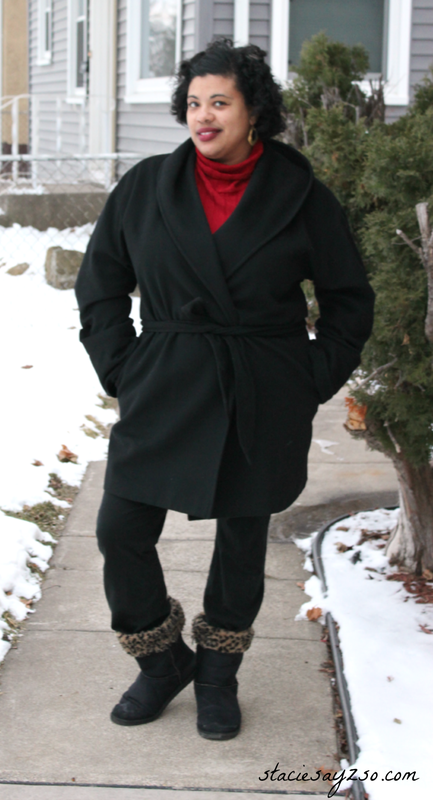 But when there are mild temps or I want to dress up, this is my go to coat. Such a cute wrap coat! I'm with you on the windchill... I'm in Illinois and we're in the negative temps all day with the windchill. I'm scared for tomorrow & Wednesday as it's going to be even worse. Stay warm gorgeous. Thank you! Yep, I feel ya! I think we're stuck in the same weather pattern. Bundle up! Believe it or not, I used to sew. I made all sorts of clothes but that was years ago. Even then, making a coat would be pretty hard for me too. Cute coat!!! That sounds extremely cold. It's in the low 30's where I live and that is too cold for me. I'm ready for some more 50 degree weather. Oh, how I wish! 50's would be a warm Spring here. Love your coat! Cute pictures!!! I love a great wrap coat they are so flattering! Wrap coats really are great for any figure! Thanks Louida! New York & Company is super cute isn't it?! Don't you just love when a favorite trend comes back in style and you can pull an old gem out of your wardrobe to participate in it? You look fab in your coat! Thank you, dear. Yes I do love that I held on to this coat. I usually donate them, then get mad when it comes in style. I have quite a few coats too, but no furs. I should since it's so darn cold here! this looks lovely and you look stunning with it! I love the outfit! Nice coat!